CatEye Strada Digital Wireless Computer - Compatible with all ElliptiGO models 0 out of 5 based on 0 ratings. 0 user reviews. The Strada Digital Wireless combines all the cycling functionality of the popular Strada Wireless computer including distance, speed, average speed, odometer, time, and wireless cadence. Using the latest 2.4GHz digital wireless speed and ISC-10 cadence sensor, the Strada Digital Wireless RD410DW is now virtually interference free and features automatic sensor recognition so you can track all your rides no matter which bike you choose. 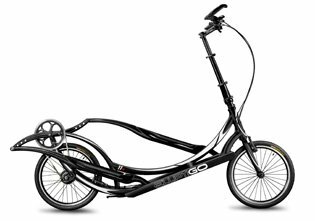 ElliptiGO installation recommendations: To aid you in configuring the Strada Digital Wireless, the ElliptiGO wheelsize is 1516. The sensor should be mounted on the rear frame of the ElliptiGO on the non-drive side (opposite of the chain). The wheel magnet gets mounted on the rear wheel spoke and the cadence magnet is mounted on the inside of the crank arm between the longest and second longest hole position.